It’s difficult to find words to describe precisely how terrible this book is. Newbury and Hobbes are crown investigators working for Queen Victoria–who is still quite alive, even though it late 1901–looking into cases that are important to the monarchy and government. Newbury apparently involved in the occult, although we mostly have only his word for it. Hobbes is hired as his assistant, the plucky young woman who gets to swoon over the dashing and handsome investigator. First, we have a prologue that is set in India, introduces characters that we never see again, and shows us things that could have been summarized in a single sentence, “This revenant plague seems to have come from India.” And for all the time we spend on the revenants, we are never given any inkling of how this plague might work biologically, which is part of a different problem I’ll get to in a bit. She drew her coat around herself, an unconscious gesture that revealed her horror at the sight of the wreckage and the carnage it represented. I noted, “The second half of that sentence is completely unnecessary.” Not just unnecessary, it’s pretty much redundant. But really, that’s a minor quibble compared to things that come later. 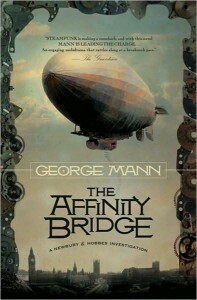 So, they are wandering through a crashed airship–one that is repeatedly described as unstable and highly dangerous. Stepping back, and looking around her to ensure no one was watching, she hitched her skirt up above her knees and sent her booted foot flying into the centre of the door. It gave a little in the frame, splintering where the wood had been stressed by the heat. She tried again, this time putting her full weight behind her as she drove herself forwards into the door. Good idea, when you’re in an unstable structure, to kick in doors that might possibly be the only thing supporting the ceiling above you. I’m sure the worst thing that could happen is embarrassment when someone sees your bloomers. No wonder the British empire fell. A few pages later, we see the automaton in action. The automaton set to work immediately, crossing the room with a fluid gait, avoiding a pile of machine parts on the floor and approaching the table with the utmost precision. A man in his fifties, with greying hair and a slight limp in his left leg, was leading two automata into the room. They walked with the typical mechanical gait of the others of their kind, but were each dressed in a neat black suit and tie, and one was clutching a violin and bow firmly between its padded brass fingers. So yeah, I take issue with the automatons. But never fear, not only does this story lack a basic grasp of technology, it ALSO lacks a grasp of biology! This is a device of some sort that is supposed to help repair a man after serious–even life threatening–wounds. The alarming contraption above (his) own table was connected to an extensive brass framework, a kind of large gun on a moveable rail, with fat tubing trailing from the back of it and disappearing into a nearby hatch in the floor. The device had a trigger fitted to the undercarriage and the end of it terminated in a spread of fine needles, bunched together to form a neat point. (he) shivered. He brought the gun closer to (his) shoulder, and then, without any further warning, he jabbed the device into the soft tissue underneath the skin of (his) left arm. The needles began to puncture the lacerated flesh in a torrent of relentless pinpricks. (He) screamed out in agony as the device stitched a series of fine filaments deep into his clavicular muscles; slowly, deliberately, knitting his shoulder back together. But work it does! A man who is described is almost dead is–within hours!–able to get up and take on two automatons! And then after getting beat up MORE, run off and get into another fight! Even with magic, there is no way in hell someone could suffer life-threatening injuries with a large loss of blood, and then after a brief nap and a small meal, go get into another fight. Modern science doesn’t allow for recoveries like that. It just doesn’t. And if it’s magic, then where is the energy for this magical repair coming from? After an injury, normal healing requires extra sleep and calories to repair the damage. If a magical healing sped up the process, then the individual should need even MORE sleep and even MORE calories. And that’s how most fictional systems of magic do it. The price of healing has to be paid somewhere by someone. But here we have a magical elixir that is given once, doesn’t require an increased caloric intake and rest for repair–and continues to work even as the body receives more damage in another fight. “You fought him on the top of a moving ground train?” Veronica’s voice was strained. Everywhere she looked, she saw faces she recognised, as well as ten others she did not. And I’d like to point out this was put out by a major publisher, and theoretically should have been professionally edited. However, I find that harder to believe than much of what passed for science and technology in the story. To sum up: this was terrible, and the only thing that kept it from being a wall banger is I wasn’t going to damage my kindle over it.